Here’s a complete rundown of all the gluten free chain restaurants menus you will find on this site. Just click on a restaurant and you will be taken to their full gluten-free menu. 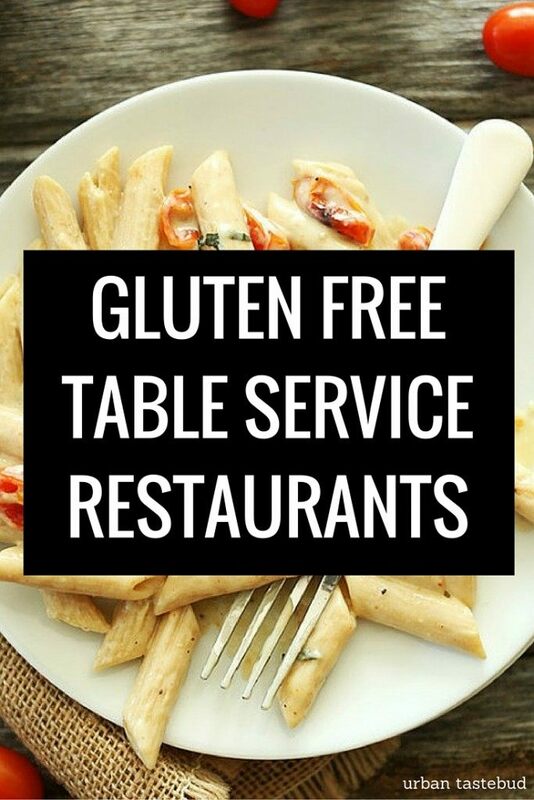 Over 250+ More Gluten Free Menus! And for a listing of over 250+ gluten free restaurant menus, check out our newly updated GF Restaurants + Dining Guide! If you’re looking for a hard copy of these gluten free chain restaurants, be sure to check out my Gluten Free Guide to Restaurant Chains, which is available on Amazon.com (kindle and print), Barnes and Noble, and the iTunes Bookstore. p.s. Please be sure to share this complete listing of gluten free chain restaurants with anyone that will find this menu listing to be very helpful. Thank you again! Is there a gluten free chain restaurants menu that love but don’t see on this listing? If so, please let us know in the comment section below. Thanks! How about one for Gordon Biersch? Texas Roadhouse is a wonderful steakhouse and they have been terrific with gluten free for me. Would also like to see Texas Roadhouse gf menu here. My niece and nephew love it there and she and their girls are all gluten free. The Texas Roadhouse in Wausau WI seemed oblivious to the GF request initially. We went thinking a Steak House could accommodate the request, but the waitress left us feeling very uneasy. She claimed the spices used would contaminate the cooking surfaces, and they could not guarantee GF dining. Maybe this is true, and she was just being honest? Why is Chipotle not on there? I see a separate article about them though. Costa Vida; everything on their menu is gluten free except the flour tortillas and a couple of their desserts. I have been to Cheddars and Daves BBQ and neither had GF menus! The chef talked with me at Cheddars, and I got a book with all the ingredients at Daves. Tarahumara, tucanos, dairy keen, cafe galleria all have gluten free. Dairy keen is the best place to get a gluten free hamburger and French fries. Yum. Jason’s Deli has GF menu that rocks!!! Wayne Gretzky’s in Toronto has gluten free burgers and O’Doughs Gluten free buns!!! You are so right.In order for it to be gluten free establishment it must not contain any gluten at all . I’ve learned that much just the airborne of it that travels around area with food items may cause contamination. What about California Dreaming? I read somewhere they have a decent GF menu. In Pocatello, Idaho, the Buffalo Wild Wings GF Menu is a JOKE!! They gave me a list of EVERY food they sell and all the ingredients to each one and told me to find something to eat. It was 4 pages long, typed in a size 4 font, had x’s and check marks without distinguishing what each stood for, and obviously used in the kitchen because it was filthy from food splatters!! Are there any restaurants that are 100% Gluten Free? Or any franchises that offer100% Gluten Free products? Add http://www.currytosgrill.com/ in Grill Restaurants also. Would love Cracker Barrel listing! Cracker Barrel does have a GF menu. How about any Subway restaurants? A lot of these places are not safe for people with Celiac Disease. Domino’s shouldn’t even be on this list because they make their gluten-free pizza right on the same board as the regular pizza. They even have a disclaimer saying that. Also, Texas Roadhouse uses a seasoning on the grill that contains gluten, so even if you order your steak without seasoning it won’t matter because the grill is covered in it. They will not clean off an entire grill for one customer. Buffalo Wild Wings has very few things you can ACTUALLY eat because of cross contamination. Their menu states this. I don’t know why places bother having gluten-free options if the people who need to eat that way can’t even eat it. Cheesecake Factory has a good gluten free menu. I agree with Joy about offering “gluten free” options when cross contamination is still a big issue. Few places offer gluten free kitchens or cooking areas. I’d like to see a listing of Gluten Free restaurants where the whole kitchen and menu is gluten safe. Cheese Cake Factory has a legit gluten free menu when you go there you just have to ask as well as Smashburgar with their gluten free rolls. I agree. Would be wonderful if a Celiac could actually eat normal in so many restaurants. But let’s face if folks, few restaurants even know what Celiac is, and those of us with the disease must be vigilant for ourselves or our Celiac children. I pray for the day of “Celiac Normalcy”, but the pain of an attack keeps me away from most places. Just ate gluten free pizza at Papa Gino’s last night! The Barn in Baraboo WI fabulous for gf. They have a close relative with celiac and uses separate cooking area and own fryer. I have got sick from most “gf” menus. The Barn never lets me down! Kara Lynn’s Kitchen in Clearwater, Florida – Downtown 421 Cleveland Street. 727-447-2536 They don’t have a website but a huge Facebook following and have 4.5 start rating on YELP. They serve gluten free, organic, grass-fed meats, wild caught fish. GLUTEN-ZERO BAKERY in Henderson is a marvelous business with wonderful crew to show your support who makes absolutely, insanely DELICIOUS homemade breads, cookies, pies, cupcakes, truffles, pizza dough, holiday treats, and much more outstanding gluten-free baked delights. They have a wonderful story and are dedicated to exceeding required standards and making their products completely free of gluten and helping educate our community. Love all their yummy treats! I went into the Cracker Barrel in Boise while waiting for my tires to be rotated and when I asked for a gf menu, they said they didn’t have one. The only thing I could have off of the regular menu was tea. I go to Chipotles a lot because they’ve been trained to deal with celiacs…but watch them. Every now and then, somebody forgets a step. The Outback Steakhouse in Caldwell has trained their staff, as well, and I have had great success there. I also frequent a small restaurant outside of Boise in which one of the owners has to be gluten free, so they know everything and they are the only ones I can have pizza from, thankfully it’s awesome pizza! But, really, if the staff isn’t trained to deal with us and the restaurant doesn’t have a dedicated gluten-free section of the kitchen, it’s no good for us. Blaze pizza in meridian and pizza pie cafe in boise have been good for me every time I’ve been. My wife has Celiacs and believe it or not our Mountain Mikes Pizza in Castro Valley has a very good gluten free pizza. They do not make it there but they still need to know how to not cross contaminate but she has had it many times with no problem. Twigs in Rochester Minnesota is completely gluten free. The owner has celiac’s so the kitchen is separate and every item on the gluten free menu is completely safe.